Need to purchase a UW Zoom account? Wondering about pricing? Check out the UW Zoom Web Order Form. Want to try before you buy? Log in to UW Zoom to get a free limited-featured UW Zoom Basic account. See what features are included in the UW Zoom Basic account. Zoom provides HIPAA- and FERPA-compliant video collaboration. 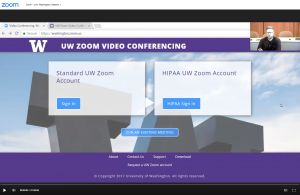 To request a HIPAA-protected UW Zoom account, submit the UW Zoom order form and choose the HIPAA option. Zoom can connect with SIP or H.323-based video conference devices like Polycom, Lifesize, and Tandberg. Included with your Zoom Pro account is a free phone conference line. Participants of your web conference can simply dial a phone number and code to enter your meeting. This is helpful when internet access is not available for some of your participants. Zoom also hosts live training sessions. Register here. Watch a recording of the webinar ‘Introduction to UW Zoom’ — recorded January 10, 2018. 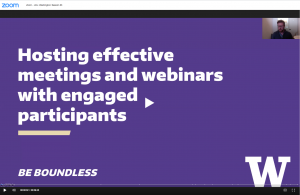 Watch a recording: “Hosting effective meetings and webinars with engaged participants.” Recorded April 11, 2018.